The two closest men to Our Lady during her earthly life, besides Our Lord, were present in the Knock apparition. St. Joseph, who was the head of the Holy Family until his death, and St. John the Apostle, who was entrusted with her care as his mother by Our Lord himself from the height of the Cross. This is one link between the three figures at Knock. 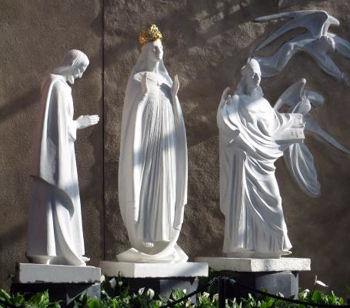 But there is another connection that finds support in Tradition, events and teachings: It is possible that all three figures in the apparition at Knock are alive. It is an infallible dogma of the Church proclaimed by Pope Pius XII that Our Lady is alive, and went to Heaven, body and soul, where she reigns as Queen. No one can deny this fact and still be a member of the Catholic Church. Concerning St. Joseph there is a strong possibility that he also is alive. It is not an infallibly defined dogma, but there is a tradition that says St. Joseph resurrected and is with Our Lord and Our Lady in Heaven. I remember hearing many years ago from the late Spanish theologian, Fr. Royo Marin, that most Catholic theologians believe St. Joseph is alive and in Heaven. One of the reasons they give is that Our Lady wants St. Joseph in Heaven to have the Holy Family reunited. Indeed, why should Our Lord and Our Lady wait until the end of the world and the resurrection of the bodies to only then have St. Joseph with them in body and soul? I believe these arguments of probability that St. Joseph could be alive are quite compelling. Also interesting and important for our times is the appearance of St. John, the third figure of Knock, dressed as a Bishop. Concerning St. John, the proofs that he could be alive are even more numerous and convincing. St. John was the only Apostle to not flee during the Passion of Our Lord. Perhaps, as a result, he is the only Apostle to not suffer a martyr’s death… not for lack of hatred of the enemies of the Church who submitted him several times to martyrdom, but because he did not die in those trials. It appears that there was more than one attempt to kill St. John. Below is what most consider to be the last attempt, the proverbial ‘last straw,’ that made the Roman Emperor decide to exile him to Patmos Island. 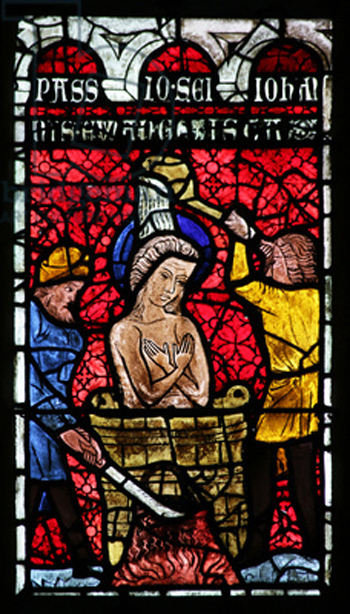 “In this time Domitian was Emperor of Rome, which made great persecutions unto Christian men, and did take St. John, and made him be brought to Rome and made him to be cast into a vat full of hot oil in the presence of the senators, of which he issued out, by the help of God, more pure and more fair than he entered in, without feeling of any more heat or chaffing. So, here we see that St. John not only survived the order to kill him, but was actually rejuvenated in the presence of the senators of Rome. It was an attempt to end his life that had the opposite effect, i.e., he lived longer. At the end of the last chapter of the St. John’s last Gospel (21: 21-25), there are very interesting words. These words could even be the last written words of the entire New Testament since there is a tradition that St. John’s Gospel was written after the Apocalypse. In St. John’s Gospel we read about “the third time that Jesus was manifested to his disciples, after he was risen from the dead.” After being initially inappropriately dressed when Jesus appears (Peter “girt his coat about him, (for he was naked,)”, and being questioned three times by Christ concerning his fidelity (“Lovest thou me?”), Our Lord confirmed the charge of Peter over His sheep (“Feed my sheep”). Then, while following Jesus, Peter looked back and saw John following them and asked: “Lord, and what shall this man do?" Jesus saith to him: So if I will have him to remain till I come, what is it to thee? Follow thou me. So, God, through the pen of St. John, ends the Gospels with a chapter in which Jesus questions Peter (and therefore all future Popes) three times, pressing him to remain faithful and, then, ends the chapter with another question to Peter appearing twice: “If I will have him remain till I come, what is it to thee?” Perhaps Our Lord, closing the Gospels with these words, was giving a message to those who have eyes to see and ears to hear: St. John “has remained,” and will remain alive until the end of the world. Also, there is something very subtly implied in the last sentence. It tells us that even the written word would not be a sufficient testimony: “The world itself … would not be able to contain the books that should be written.” By this, John seems to imply that it would be necessary for him, the witness, to come and “give testimony of these things.” That he, the Disciple who knows the truth, must come. 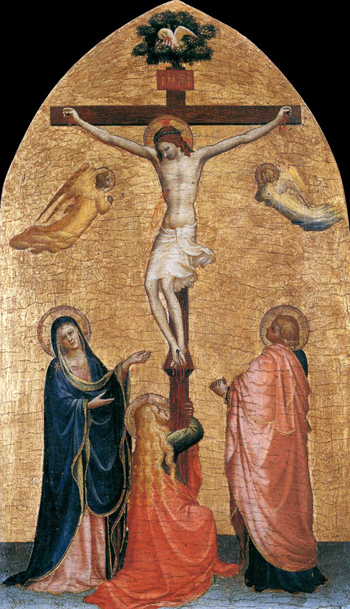 In this article I have presented traditions and texts of Sacred Scripture that support the idea that St. John is alive. In the next article I shall present teachings of Saints, Doctors of the Church and theologians favoring this hypothesis. I, Margaret Byrne, née [born] Bourke, widow of Dominick Byrne, deceased, live near the chapel at Knock. I remember the evening of the 21st August. I was called out at about a quarter past eight o’clock by my daughter Margaret to see the vision of the Blessed Virgin Mary and of the Saints who appeared at the end of the little church. It was getting dark; it was raining. I came with others to the wall opposite the gable. I saw then and there distinctly the three images, one of the Blessed Virgin Mary, one of St. Joseph, and the third, as I learned, that of St. John the Evangelist. I saw an altar, too, and a lamb on it somewhat whiter than the altar; I did not see the cross on the altar.